This could be a first: Al Sharpton criticized for being insufficiently inflammatory; faulted for not shooting from the hip. At the opening of today's "Morning Joe," host Joe Scarborough panned the Rev's "O'Reilly Factor" performance last evening, in which the normally obstreperous one was relatively subdued on the subject of his host's comments on Sylvia's restaurant in Harlem. 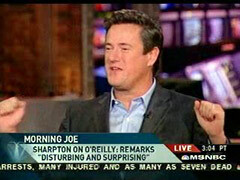 Scarborough later escalated his criticism, calling O'Reilly a "moron," and accusing him of making "racist" comments. 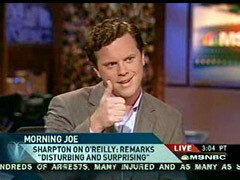 JOE SCARBOROUGH: Al Sharpton went on Bill O'Reilly's show last night, and apparently said very little. WILLIE GEIST: Well, to be honest, I didn't see him last night, but from what I read he said "I'm going to wait and listen to the tape. It sounds bad on paper, but I'm going to give you the benefit of the doubt." MIKA BRZEZINSKI: It sounds bad on tape, too. SCARBOROUGH: It does; it sounds bad on tape. You know what else sounds bad? I wonder if Al Sharpton waited three or four days until after the Don Imus dust-up. [Imitating an imaginary Sharpton] "And you know what, I really haven't had time to listen to the [Imus] tape, I'm gonna wait." Come on: what's going on here? He's giving O'Reilly a break. All he has to do is take about ten seconds and listen to what Bill O'Reilly said. A bit later, Joe feigned great indifference when Geist mentioned that O'Reilly had proclaimed NBC's coverage of the flap fair. GEIST [shown giving the thumbs up for the good news]: It looks for the moment like NBC is on his good list. SCARBOROUGH [shown in mock exultation]: Really? Hey! So we're off the enemies list! Boy, that makes me [affecting an exaggeratedly deadpan expression and tone of voice] so, so hap-py. Yeah. What-ev-u-h-h-h.
Got that, Rev? Joe wants you to stop being so reticent: lose the shrinking violet act! Update 07:25 A.M. | Scarborough sharpened his attack in a subsequent segment. Joe rolled the tape of the O'Reilly Factor exchange between Bill and Al, at the end of which O'Reilly made reference to having picked up the tab for the pair's dinner at Sylvia's. SCARBOROUGH: What a moron! "[Imitating O'Reilly] I picked up the tab and now I'm getting attacked so it's alright for me to make racist comments as long as I go to a Harlem restaurant and pick up the tabs."